Doing your hair is just part of your morning routine. Wash, dry, and style. I decided to take a look at my hair by the numbers, especially since I spend countless time and countless dollars on products, curling irons, highlights, etc. My fancy calculations break down like this, I spend nearly 45 minutes on my hair a day. That includes wash, dry, style. If I spend 252 hours a year trying to make my hair look perfect, I don't want to make it any harder by doing harmful things to it. That's why I went to the hair doctors, a.k.a hair stylists, to see what problems they see and how to fix them. We all know that we need to get trims, but here's why. "If you don't get rid of the split ends your hair starts to break and won't be long and healthy," says celebrity hair stylist Jason De La Torre. And your hair grows everyday and over styling can cause split ends. Platform stylist Toni Love explains how often you should be going in for a trim. "It is suggested to trim the hair ends once every six to eight weeks. Nice, trimmed ends keeps the hair healthy and really accentuate the overall hair style. A good haircut is the foundation to a beautiful hairstyle. You need to take a look at your medicine cabinet and see if your products actually match your hair type. "If you are using something that wasn't made for your hair type like a heavy moisturizing shampoo/conditioner or if you have fine hair it can make the hair look and feel dry," explains De La Torre. Yes, some products can be expensive. However, if you're using the proper ones it's worth it since you probably just dropped $180 on your highlight and cut. You can also go overboard, using too many and too much. Stylist Emily Hudspeth explains the most common mistake she sees. "Too much of anything is bad. Some examples would be too much shampooing, using too much product, too much heat styling, and excessive chemical treatments, and so on." You don't need that much shampoo, unless you were in a muddle wrestling match. Too much product will only make your hair greasy and weigh it down. Most stylists are anti-box color. It's probably because so many times clients come into the salon after a mishap with some at home color and they're tasked to fix it. Here's a tip from Kylie Evans if you insist on doing it yourself. " When coloring hair at home, running the color through the ends the entire processing time. It just needs to be worked through the ends for the last 10 mins or less, if not it drys the hair out." The other aspect is full disclosure. You have tell your stylist if and what color or keratin or perm treatments you've had done. Even if you "cheated" on them you better be upfront or you'll end up with an even bigger mess. Celebrity Hairstylist Sura Radcliffe of Byu-Ti Salon explains why, "Even if you haven't colored your hair in more than a year the color is still present. This includes semi-permanent. Unless you are rocking a short bob or pixie cut it still matters. Disclose all color history to your stylist." Heat is a great tool to get your hair to participate. But too much without protection is damaging. Here's how Dr. Jeff Donovan, board-certified dermatologist and hair restoration physician with Hair Club Medical Group recommends you use heat without your hair catching fire. 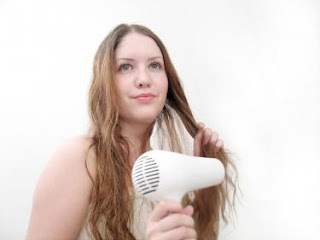 "Make sure to only use a dryer once hair is damp (not dripping wet) and keep it at least six inches away, moving it continuously over different areas. With irons, never leave them on hair for more than 15-20 seconds. Heat protectors and/or a leave-in conditioner are always recommended to help protect your strands from the very beginning and increase volume, but if possible, skip the tools a couple days a week and go au natural." Got any tips you'd like to share?? ?